Phumie has managed a backpacker lodge before as well as the maintenance department of a hotel and has farmed. 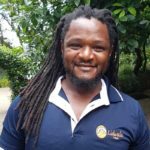 Being the son of a chief of the Mamba clan he has a flare for traditional healing, hiking and motorbike riding and a passion for tourism. Phumie has a special way of connecting with people and is comfortable discussing anything from politics and traditional beliefs to modern technology and fashion. Phumie has always said that his primary goal is to give customers the best experience possible and if you seek advice on what activities to do where in Eswatini (Swaziland), he’s your man.